FLORIDA CAR !! - ABSOLUTELY NO RUST !! - BEAUTIFUL UNDERBODY !! 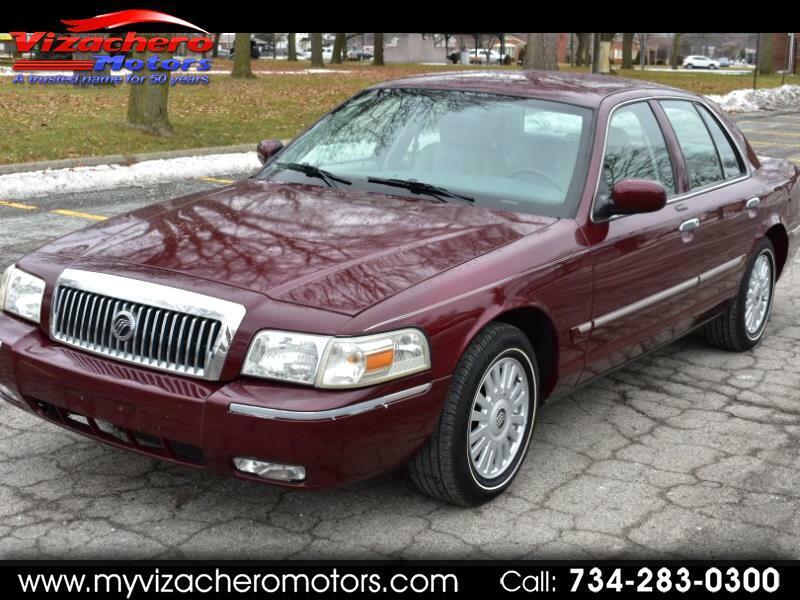 - GRAND MARQUIS LS - NEAR FLAWLESS TAN LEATHER INTERIOR - BEAUTIFUL BURGUNDY EXTERIOR PAINT FINISH - ALUM WHEELS - BRAND NEW SKINNY WHITE WALL TIRES !! - KEYLESS ENTRY - ADJ PEDALS - POWER SEAT - POWER WINDOWS - POWER DOOR LOCKS - POWER MIRRORS - INTERIOR WOOD GRAIN - AM FM CD STEREO - CRUISE CONTROL - AND MORE !!! - RIDES & DRIVES LIKE A DREAM !! - ABSOLUTELY WELL MAINTAINED - GREAT CAR TO DRIVE - A MUST SEE AND DRIVE - THIS IS A GREAT SEDAN WITH NO RUST !!! - PLEASE STOP IN FOR A CLOSER LOOK AND A TEST DRIVE !1 - WE ALSO OFFER GUARANTEED CREDIT APPROVAL FOR ALL!!! - PLEASE BUY WITH CONFIDENCE...OVER 58 YEARS OF AUTOMOTIVE SALES AND SERVICE ...OVER 6000 VEHICLES SOLD ! !1 - HOPE TO SEE YOU SOON!!! VISIT OUR WEBSITE WWW.VIZACHEROMOTORS.COM OR CALL 734-283-0300 TO SEE MORE PHOTOS AND OTHER INVENTORY. WE ALSO OFFER GUARANTEED CREDIT APPROVAL FOR THOSE WHO NEED HELP WITH FINANCING! PLEASE STOP IN FOR A CLOSER LOOK & A TEST DRIVE! "CARFAX" REPORTS ON EVERY VEHICLE! THANKS AGAIN FOR LOOKING IN - HOPE TO SEE YOU SOON! "VIZACHERO MOTORS" A TRUSTED NAME FOR OVER 50 YEARS! VIZACHERO MOTORS - 1411 FORT ST - WYANDOTTE, MI 48192. 734-283-0300. Message: Thought you might be interested in this 2008 Mercury Grand Marquis.